I wish to thank Dr. Carolyn Ives, Dr. Paul Martin, and Dr. Valerie Henitiuk, of the Centre for the Advancement of Faculty Excellence, for the invitation to speak here today, and the Canada Research Chair’s program for funding to support my research. It’s a pleasure to be here. What is the point of global awareness week? The question may seem too obvious to ask, but I ask it seriously, because it can be answered in many different ways. Most of the common answers we hear stress the need for our national economy to remain globally competitive or for our national culture to adapt to our migrant-led demographics. These are some of the drivers, certainly, that are motivating Canada’s recent turn to the global. People are asking: what is at stake for Canadians in global trends? But this may not be the best way to frame the issues. It assumes the nation exists in isolation from its global and international contexts, as if it were one potted plant among many instead part of an ecosystem, where what happens in one part of the world impacts other parts. 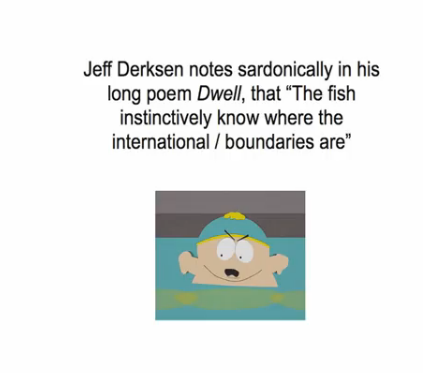 To see the nation as singular and separate is to assume, as poet Jeff Derksen notes sardonically in his long poem Dwell, that “The fish instinctively know where the international / boundaries are” (1). Put another way, there can be no such thing as a “no peeing section” in the global swimming pool. The implications for how we understand knowledge production are similar. For Ulrich Beck, we have inherited forms of research that rely on “methodological nationalism,” a mode of proceeding no longer suited to how the world operates today. Beck suggests replacing that focus on a single nation in isolation by learning to think through “methodological cosmopolitanism,” a mode of understanding that seeks to understand the kinds of border crossings that seem to characterize life today. Beck is not opposing the national to the cosmopolitan so much as insisting that they co-constitute each other interactively and noting that the national is only one component of the many categories that shape our subjectivities and imaginations today. Global awareness involves many components—most fundamentally, how we situate ourselves in time and place, through media, and the interpretive strategies (including different kinds of literacies) available to us today. I am currently involved in two research teams investigating how to theorize transnational literacies, forms of meaning-making that can prove adequate to understanding our globally interconnected world in ways that can do justice to the insights of the many peoples whose values were dismissed by the modern expansion of Europeans around the globe. One partnership team, Brazil/Canada Knowledge Exchange: developing transnational literacies, funded by SSHRC, is explicitly devoted to working with English language teaching in ways to expand its capacity to encourage critical thinking while resituating English as just one language among many and turning it away from its imperialist legacy. The other team is global, funded from Finland. This project, Ethical Internationalism in Higher Education, studies “how epistemic difference, transnational literacy and notions of global citizenship and social responsibility are constructed in internationalization processes of higher education.” By epistemic difference, we refer to those “forms of knowledge and subjectivity historically marginalized” by academic knowledge production. Transnational literacy, then, revalues epistemic difference, and through that revaluing changes both what we value knowing and how we learn to know. Epistemic difference is located within the globe’s many different languages, as well as in the specialized forms of discourse associated with different disciplines. According to Gayatri Spivak, transational literacy therefore requires “deep language learning” and dialogues across disciplines. It is hard to be globally aware if you are monolingual. Yet one of the trends in the internationalization of higher education is to move away from linguistic diversity. Anglophone Canadian students can take courses at universities around the world without ever needing to know the local languages where they are studying. This can be an illusory advantage. Historically, literacy, especially literacy in English, was used to discriminate between types of knowledge and the people who generated them. While some trends in globalization perpetuate those uses of literacy; other trends create conditions in which truly transnational forms of literacy may be developed. Transnational literacy, in its fullest sense, enables us to reimagine the possibilities of our world. This matters because there can be no global social justice without global epistemic justice (Boaventura de Sousa Santos et al). 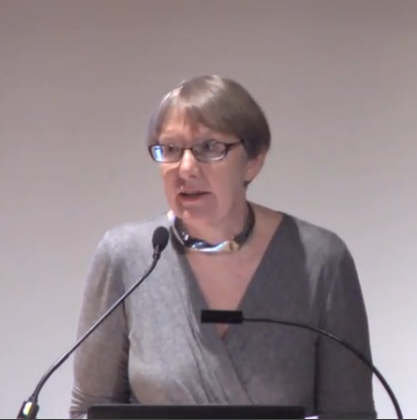 Canadian philosopher Lorraine Code suggests that globalization stretches our imaginations. That stretching takes many forms, some painful, and many pleasurable. Theorists interested in the ways in which “a people imagine and act as world-making collective agents” (Gaonkar 1) have termed this process a “social imaginary.” Social imaginaries “build upon implicit understandings that underlie and make possible common practices,” “mediating collective life,” and enabling individuals to “understand their identities and their place in the world” (Gaonkar 4). Modern social imaginaries, they suggest, take many forms beyond the national, but in one way or another, they are “based on relations among strangers” (Gaonkar 5) and they constitute a “world-forming and meaning-bestowing creative force” (6). In other words, the imagination is no longer seen as “derivative, the mere reflection of what is already there” (6). Instead, it is seen as an agential and creative force in its own right. It is the “structuring matrix” through which we are able “to conceive of the real in the first place” (7). To conceive of the imagination in this way is important because the conceptual frameworks through which we understand the global challenges of our times carry implications for how we understand our current options, how we imagine the future, and how we envision our roles in bringing it into being. As a literary critic, I am especially interested in how this increased role for the imagination as a force in social life brings my work into closer dialogue with that of social and political thinkers. I study the simultaneous interplay of Canadian, decolonial, indigenous, global, and postcolonial imaginaries within fictional and theoretical productions. Within these spheres, the imagination confers agency. There are strong pressures in many currently dominant imaginaries that deny the human imagination agency in imagining how the world could be otherwise. It is important for us to resist such ways of seeing our potential to make change in the world because such views are not fair representations of our potential and because they deny our capacity to make a better world. Globalization is often presented as if it were an irresistible process of capital expansion, environmental devastation, and cultural imperialism that can neither be changed or resisted. To be globally aware, we need to question such myths and test them against what is actually happening both here and in other parts of the world. Amartya Sen notes that both anti- and pro-globalization theorists often share the mistaken belief that globalization is largely the same as Westernization 124-5). This illusion ignores the long history of global interactions and exchange across many borders. As Sen puts it: “Europe would have been a lot poorer—economically, culturally, and scientifically—had it resisted the globalization of mathematics, science, and technology coming from China, India, Iran, and the Arab world, at the beginning of the second millennium” (129-130). Globalization has a longer and more complex history than is often recognized. And it has always involved choices among priorities. There was nothing predestined about it. Like all times, ours is a time of competing stories. A dominant story argues we live in unprecedented times. We live in a transitional moment. The key question to ask is what makes this transitional moment matter? What choices do we face and what are the limits constraining our choices? This is a time when many national institutions are reframing their international mandates, seeking input for charting new directions forward. These institutions include the Association of Universities and Colleges of Canada – AUCC, the Canadian Association of University Teachers – CAUT, the Canadian Bureau for International Education –CBIE, and the International Council for Canadian Studies – ICCS. They are asking: what is Canada’s place within the evolving global higher education regime? How should research and teaching practices be adapted to address changing global realities? We can learn at least two things from the tenor of these questions. Firstly: global awareness and national awareness are co-dependent. They implicate each other. Secondly: educational systems both reflect and influence these changes. These are both important lessons because they refuse some of the common sense of earlier times. We can no longer usefully oppose the local to the global. Thinkers have coined new words, such as the glocal, to stress the ways in which local and global regularly interact. Other thinkers write about the shift from stable geographies to “process geographies.” This is a complex shift. Our orientational compasses opposing West to East, North to South, are changing in tune with shifts in global power relations and imaginative stretchings. We now understand that how ideas, products, and people circulate plays a role in how place is understood. Spivak challenges older, stable imaginings of Asia in her book called Other Asias. Regional frames such as Indian Ocean, Pacific, and Atlantic studies assume more prominence when circulation becomes the focus. Investment firms are changing their understanding of what global allocations mean in a balanced portfolio, moving away from a focus on the location of a firm’s head office to incorporate attention to its global reach. This January, our federal government launched “Canada’s International Education Strategy,” subtitled “harnessing our knowledge advantage to drive innovation and prosperity.” It classifies international education as a priority sector under Canada’s global markets action plan, and includes a chart showing the economic impact of benefits to Canada of such a strategy. This is a start. Canadians need to be persuaded of the values of redefining our interests in terms of developing our global awareness. Nonetheless, this phrasing remains an example of old thinking, telling only part of the story. We need to think harder about the strengths and weaknesses of thinking in terms of a Canadian “knowledge advantage.” It is true that the global spread of English, our proximity to the United States, and our established universities convey a genuine, if possibly short-term and short-sighted, advantage in comparison to parts of the developing world. But there is danger if the thinking behind that language use assumes we have little to learn from the rest of the world. It sounds arrogant, and if we really are arrogant, then we will not get far for long. Europe is taking a more thoughtful approach. Last December, they held a seminar called “For Mutual Gain: Euro-African co-operation in higher education.” That should be Canada’s stand too. We need to think in terms of mutual gain. Not only because it is the right thing to do, but also because it is the only strategy that works in the longer term. Ethical internationalism requires deeper thinking about reciprocal knowledge exchange. How might it be facilitated? What could it mean? A conference call for later this year announces the following theme: “Higher Education and its Principal Mission: Preparing Students for Life, Work, and Civic Engagement.” Global awareness involves each dimension of this mission. Today, national citizenship education must involve education for emergent ideals of global citizenship. As we make these adjustments, the very frameworks through which citizenship is understood also need to change. Citizenship involves rights and duties. Citizens have a right to education and they have a duty to inform themselves. With the rapid pace of global change, which operates both within and outside the nation, it is not obvious what we should be learning or how best we might continue to learn. Many of the solutions currently on offer are piecemeal. That is not good enough. We need to revisit some of the most basic assumptions on which such ideas rest. I come to these conclusions through my own educational experiences, and my subsequent research. I offer my own educational trajectory to show how some things have changed but much has not. At the end of my first year of university, I asked my introductory history professor what courses I should take in my second year. He asked me what degree I was pursuing. When I said English, he said I should take all my history courses in the history of that small island. Sixteenth century English literature from England with sixteenth century English history, and so on through the centuries. They would complement each other. By the end of four years, I would be a specialist. When I said I would like to learn more about Canada, he dismissed my views. Just by living here, he suggested, I would absorb enough knowledge of Canada by a kind of osmosis. I tested his advice the next year, but found it claustrophobic. I was reading some of the same books in both history and English courses, and while the different disciplinary perspectives that emerged on these texts were interesting, I wanted a broader education. The next year I took Russian and Chinese history and have never regretted it. At that time, there were no Canadian literature courses I could take for my honours English degree. In my fourth year, a French professor offered a course, in English and French, under an interdisciplinary rubric, and I began to realize how much more I needed to learn about my own country. For my doctoral studies, once again, I decided to ignore the advice of my favourite professors, who had advised me to study in the United States. Instead, I travelled to Australia in search of a comparison to help me understand Canada. That context led me through Commonwealth, postcolonial, settler colonial, and interdisciplimary globalization studies, to the point today, where I see a consensus emerging from many different parts of the world and from every section of the university campus, that education itself needs to be decolonized. I am not suggesting you should ignore your professors, but I am saying that the questions we ask about the world and the ways we as a human community have developed to know our world, must constantly be tested against the challenges of our times and our human aspirations for a good life. In my first year history course in 1968, we studied Frantz Fanon’s The Wretched of the Earth. That book remains as compelling today as it was then, yet my students are reading it differently today in the light of everything that has happened since, and their own life experiences. Civil society activists in South Africa are also reading Fanon for their own purposes. We need to develop ways to connect these different groups of readers and share their understandings. Transnational literacy involves learning to read Fanon in the context of his times and of ours. So what has changed? The 1970s saw Canadians embracing the agenda of the Symons Report on Canadian Studies, To Know Ourselves. That nation-based agenda is now being revised, from knowing ourselves within the contexts of a methodological nationalism, to knowing ourselves within shifting global and transnational contexts, looking back as well as forward through time. To know ourselves as Canadians is to know about the history that preceded settler colonialism in this country, to understand the devastation wrought by that period of ongoing colonization, and to start to address it by learning to learn from indigenous knowledges, both here and around the globe. How we decolonize will depend on where we live and the goals we set ourselves. Mi’kmaw scholar Marie Battiste subtitles her 2013 book, Decolonizing Education, “nourishing the learning spirit.” That is the first task. In Canada, as she argues, nourishment comes from acknowledging indigenous knowledge alongside those forms of Eurocentric knowledge that have dominated the very definition of knowledge to date. Decolonization will only come from revaluing the diverse contributions of the many place-based knowledge systems created across the world. To stress their inderdependence, Boaventura de Sousa Santos calls this an ecology of knowledges approach. For me, that’s part of what global awareness means. It is learning to understand, on the one hand, how global systems of imperialism and capitalism have used education to divide the world (as John Willinsky argues), privileging some ways of knowing and denying others by actually rewarding an ignorance of them. That ignorance involved the denial of coevalness to conquered and marginalized peoples; that is, they were seen as trapped in traditions of their past and confined to a singular identity conveyed by birth, whereas only Westerners were seen as capable of growing and changing through time. To move away from such beliefs, which still drive much of the rhetoric of the war on terror, we can learn instead to re-see the world through other eyes (Andreotti and de Souza). To re-see the world through other eyes. That is not as easy as it sounds. In a book provocatively titled, Against World Literature: on the politics of untranslatability, Emily Apter writes of her uneasiness “in the face of the entrepreneurial bulimic drive to anthologize and curricularize the world’s cultural resources,” and the “tendency to zoom over the speed bumps of untranslatability in the rush to cover ground” (3). Her metaphors are suggestive. Too often, global awareness can be confused with consuming other cultures without gaining nourishment from them for the truly learning spirit. The bulimic gorges and purges without taking time to digest. Speed bumps refocus attention from the end of the learning journey to the nature of the journey itself. In that sense, I find them similar to the metaphor of friction offered by Anna Tsing in her book Friction: an ethnography of global connection. Polite Canadians sometimes see friction as a negative thing. But Tsing argues that “the messy and surprising features of [such] encounters across difference should inform our models of cultural production” (3). To develop global awareness, she suggests we focus on “zones of awkward encounter, where words mean something different across a divide even as people agree to speak” (xi). Marta Dvorak and I worked with that focus in developing our book Crosstalk: Canadian and Global Imaginaries in Dialogue. We began our book by asking: “How do readers negotiate meaning in contexts where norms of understanding diverge? What are the fictions that shape Canadian engagements with the global and how are they changing?” (1). To answer such questions, we refused to turn away from the frictions that come with such negotiations, which we labelled crosstalk. According to Tsing, “Rubbing two sticks together produces heat and light; one stick alone is just a stick. As a metaphorical image, friction reminds us that heterogeneous and unequal encounters can lead to new arrangements of culture and power” (5). Friction can be productive if approached in the right spirit, if it enables us, as Tsing suggests, to get a proper grip of the global. If it can lead to negotiations that do not end in stalemate. I have been criticized for saying I want conversations to be productive. Some people think university should focus solely on critique. But I see critique and creation as part of one another. They function best together. Denying ourselves a productive as well as a critical role is to misconstrue how knowledge work functions. My research with the SSHRC-funded Globalization and Autonomy project and the Ford-foundation-funded Building Global Democracy project suggests that current frameworks through which internationalization is understood need to be revised in the light of the diversity of global knowledge systems and the interlocking global trade relations, which ensure that Canadian lives are linked to garment factories in Bangladesh and mines in parts of Africa and Peru. As part of that revision, each element in the title of this talk also requires rethinking. My title suggests that students and researchers are also global actors, and that together we are involved in developing new learning cultures. The roles of students and professors are clearly distinguished within our higher education system, but in referring to us as students and researchers, I also wish to suggest that increasingly some dimensions of our roles also overlap. Students are increasingly, even at the undergraduate level, participating in research; and researchers are lifelong learners. In our dedication to learning, students and researchers share a common purpose. As a literary scholar, I have a special interest in stories, language, and reading as a way of making sense of the world. Globalizing and decolonizing processes are changing how each of these forms of acting are understood, and how change itself can be imagined. As governments and citizens increasingly require research to be explained, shared and justified with a wider public, the Canadian academic community has become interested in the idea of the public intellectual. Edward Said has famously defined the job of this figure as speaking truth to power. To date, this has been a highly gendered role, confining its function to a contestatory relationship within an elite constituency and usually operating within a national framework. As such, the role is being rethought within decolonizing, democratic, feminist, and international contexts. Furthermore, with transnational connectivities being widened and deepened by the world wide web, migration, and travel, what we mean when we call something “public” and what we might mean by “intellectual” is also changing. In “Beyond the Book: Reading as Public Intellectual Activity,” Daniel Coleman suggests two important revisions to the ways we conventionally think about intellectual activity and the act of reading. He suggests that “we think of public intellectualism as a set of activities rather than as a person, activities that many people already participate in” (205). This move from a focus on the individual toward collaborative and more democratic team work is beginning to change how those of us in the humanities think about our mandates. We already read work created by a global network of academics. The next step is to work more closely with them on an ongoing basis, co-creating the work as we go rather than waiting for it to be externally vetted and published. Here is Coleman’s second point: through analyzing the history of the Haudenosaunee two road wampum, with “its iconography of equity, autonomy, interrelationship, and ecological responsibility,” a form of text the arrrivant Europeans to North American did not know how to read, he argues convincingly that “we need to reconceive reading, the central activity of the humanities, in broader terms than we often do” (221). Reconceiving reading as culturally-specific forms of meaning-making is what developing transnational literacy is all about. Coleman’s specific argument is that Euro-American understandings need to learn from indigenous forms of meaning-making within Canadian contexts, but this argument is also relevant for renewing global awareness, and for challenging currently dominant narratives of globalization as driven solely by Western capitalism. People use the term globalization as shorthand to designate many different things. For some, it’s a sign of triumphant capitalism, to be deplored or celebrated, depending on one’s values; for some it is a homogenizing force that is creating a borderless world, and for others, such as myself, it’s a more complex process in which borders are being redefined, concepts of time and space are changing, local and global are not opposed but are becoming entangled, and change seems to have sped up its pace. Globalization has not killed the nation-state, nor has it hollowed it out, as once was feared. But globalization is not the same as internationalization either. The two systems currently co-exist in simultaneously supportive and resistant relation. When we talk about global awareness, we mean more than just a knowledge of other countries beyond our own. We also mean a sensitivity to the spread of transplanetary relations connecting people in one part of the world to people elsewhere, to the kinds of transworld simultaneity and instaneity that media enable, and to a shared sense of vulnerability to global climate change and global economic crises. Global awareness week gives us an occasion to think about the big picture questions that can get crowded out as we live our daily lives. Attention-getting details that remind us of our global involvements at the level of our everyday lives erupt from time to time. Our clothes were being manufactured in those factories that burned down in Bangladesh. Related dimensions of such entanglements are less visible. Our Canada Pension Plan is invested in the global arms trade (Nutt). Only globally-focussed research can help us discover such entanglements and only globally-informed critique and its companion, the creative, stretched imagination, can help us begin to unravel and reweave our transplanetary relations. It’s our job in the university community to follow Spivak in thinking about what it might mean “to unlearn our privilege as our loss” and to learn to learn again, though engagement with the ecology of global knowledges. Working across established borders that block such thinking is a big challenge, but we need to try if we can truly begin to answer the question of how we, as students and researchers, can better prepare ourselves for working across boundaries of culture, geography, and language in the future. Apter, Emily. (2013). Against World Literature: On the Politics of Untranslatability. London & New York, Verso. Battiste, Marie. (2013) Decolonizing Education: Nourishing the Learning Spirit. Saskatoon: Purich. Code, Lorraine. (1998) “How to Think Globally: Stretching the Limits of the Imagination.” Hypatia. 13.2 . Coleman, Daniel. (2013) “Beyond the Book: Reading as Public Intellectual Activity.” In Faflak, Joel and Jason Haslam, eds. The Public Intellectual and the Culture of Hope. Toronto: University of Toronto Press. 205-225. Derksen, Jeff. (1993) Dwell. Vancouver: Talonbooks. King, Thomas. (2003) The Truth About Stories: A Native Narrative. Toronto: Anansi. Nutt, Samantha. (2011) Damned Nations: Greed, Guns, and Aid. Toronto: McClelland & Stewart. Santos, Boavenura de Sousa, ed. (2007) Another Knowledge is Possible: Beyond Northern Epistemologies. London: Verso. Sen, Amartya. (2006) Identity and Violence: the illusion of destiny. New York & London: Norton. Spivak, Gayatri. (2008) Other Asias. Malden: Blackwell. Tsing, Anna. (2004) Friction: An Ethnography of Global Connection. Princeton University Press. Hi Diana, this is a very intriguing piece of paper and I find many interesting points overlapped with my own research topics. Is it possible for me to get the bibliographical information of all the reference materials? Ezra Lee.